Welcome to the Creations by AR Design Team Blog Hop! This month the Creations by AR Team members are sharing creations made with the new Lovely Cart and XO Heart Card Templates. 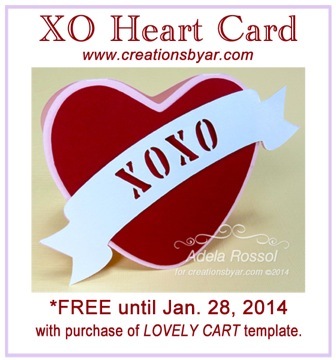 You will receive the XO Heart Card Template FREE with the purchase of the Lovely Cart template through January 28, 2014, the XO Heart Card Template is also available for purchase by itself. Creations by AR templates are available for use with Electronic Cutting Machines and also as PDF's for those who do not yet own machines. Continue reading below to see how you can win the new Lovely Cart Template! 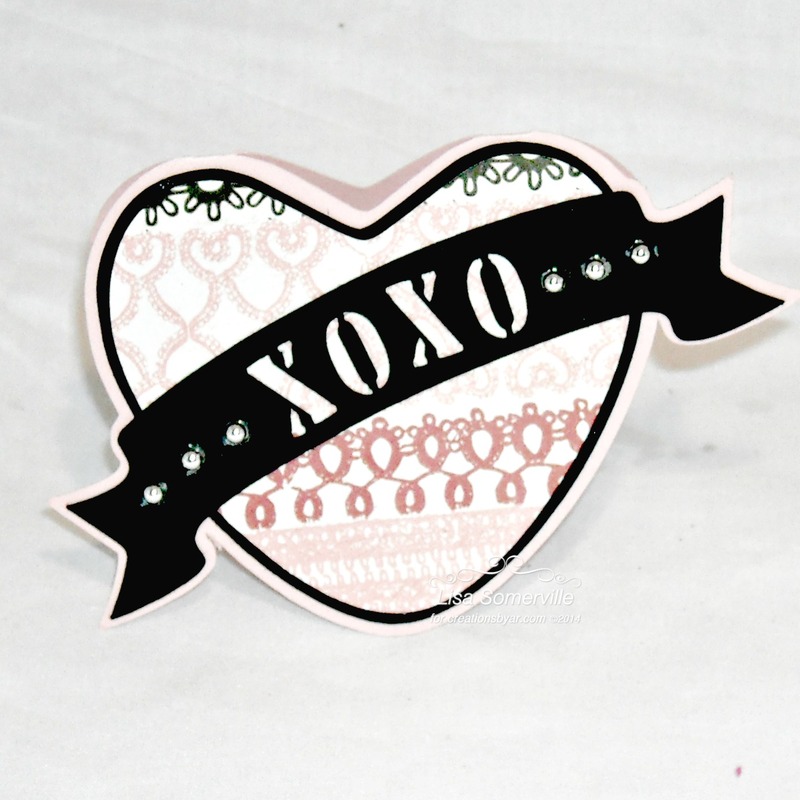 I used the Silhouette Cameo to cut both the Lovely Cart and XO Heart Card Templates, cutting the pieces from Black, White and Pink card stock, and My Minds Eye pattern paper. After opening the template in the Silhouette Software, I grouped the pieces by the color card stock I would be cutting from, then I edited the files to remove all the score (tick marks) except the ones at the very ends, so that they wouldn't show when folded. Once all the template pieces were cut, I manually added the score marks using the Scor-Pal. To embellish my card, I added Styrofoam, moss and Zva Creative Mini Roses. I also added a few Silver Gems to the awning. To create the additional layers on the XO Heart Card Template, I created offsets for the Heart and Banner templates, and die cut those pieces from Black Card Stock. To embellish I added some Silver Gems. To participate and be eligible to win, simply leave a comment on each designers blog hop post by Friday, January 24, 2014, NOON EST. Comments will also be accepted on the Creations by AR PCP Group and Facebook Page. The random winner will be announced on January 25, 2014, on the Creations by Facebook Page and Adela's Blog. 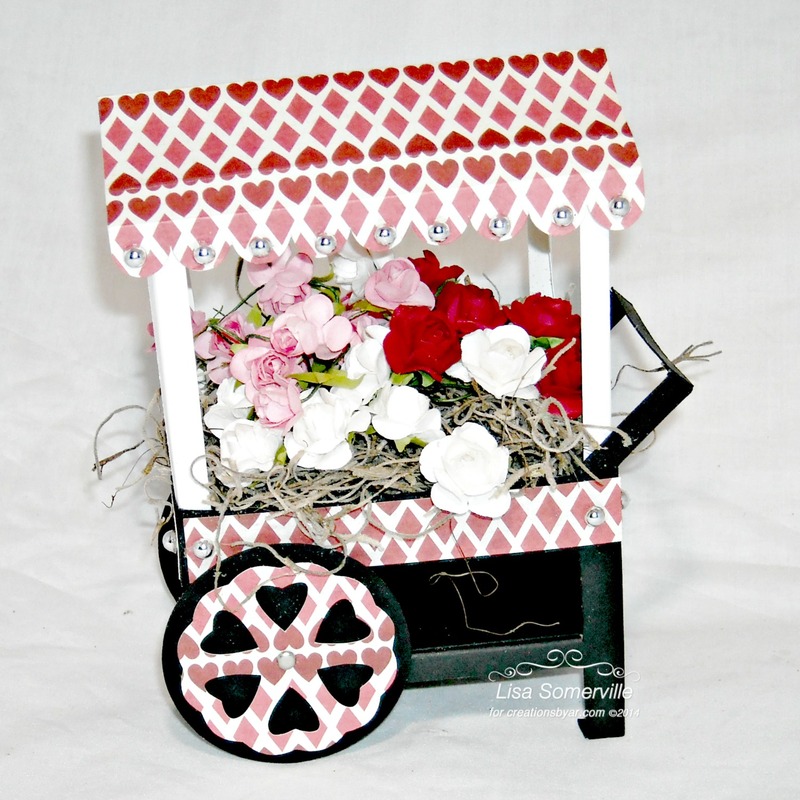 Your heart paper is perfect for your lovely flower cart Lisa! Your flowers fill it wonderfully! Great job on your projects! Love them both but that cart is just adorable! Amazing cart, love it. And I love the colors you used for your card! Beautiful versions! Love the flower filled cart. I like how the cart can look so festive with patterned paper and only minor embellishments. Nice job. Love that Valentines paper you use, is perfect. So pretty--love the heart awning. Both your cart and your card are so beautiful! So pretty, love the love awning! Love in the air! So pretty! This is just so very beautiful! I can't imagine having the patience to make something like this. It's a "wow" Lisa. What a FUN and pretty cart!!!! The flowers in it are so pretty as well!!!! Lovely, Lovely, Lovely -- as usual, Lisa! You inspire me. Love your paper choice especially using the for the awning posts and cart legs. Sweet flower display inside. Very pretty with the flowers and I like the paper. Beautimous!!! That paper is perfect for this Lovely Cart! Just darling and oh so colorful! Love your hearts and flowers! Your card and cart are gorgeous. What a gorgeous cart! As always, your creativity is amazing! Love this - thanks for the inspiration! 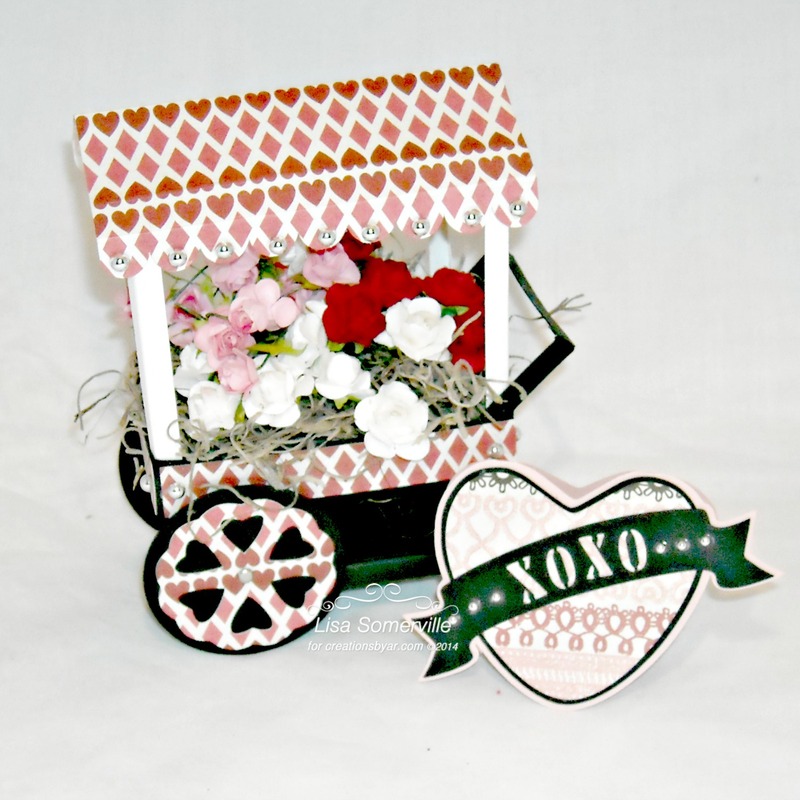 Your heart cardstock is so cute and it is perfect for this little cart. Your flowers are very pretty-like how you incorporated them in your project.